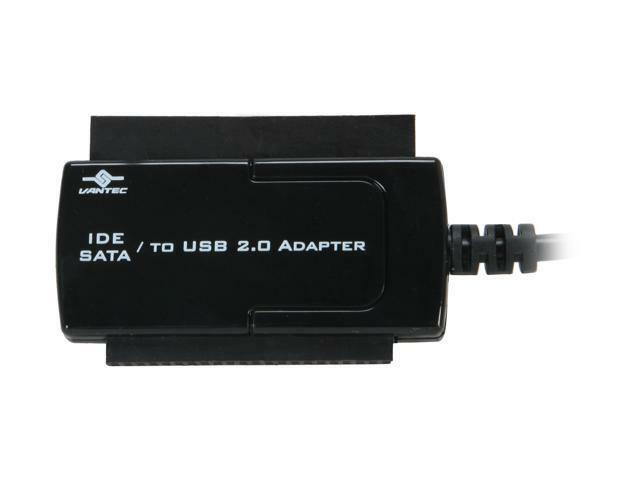 The Vantec SATA/ IDE to USB 2.0 Adapter gives you the flexibility of connecting almost any type of drive to your computer* via an available USB port. 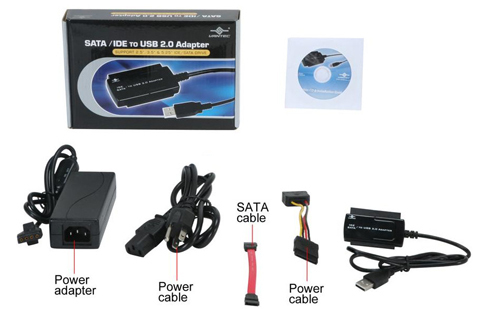 It supports SATA hard drive** and 2.5”/3.5”/5.25” IDE drive. The USB 2.0 port delivers fast data transfer rates of up to 480Mbs. It’s also backwards compatible with USB 1.1 (up to 12 Mbps). Installation is simple and quick. It supports plug & play and hot-swapping. Hard dive can be easily hot-swapped to your system without the need of rebooting. The included external power adapter allows you to power your drives outside your system, giving you the ability to quickly add or swap between drives without opening your case. **It supports HDD capacity up to 8TB. 0.39" x 2.76" x 1.69"
Cons: As I believe already listed, the connections are place too close together and its difficult to fit power and IDE at the same time. I went through about 20 hard drives, and 2 of them showed me data...all the others just showed me an I: Drive (hardware...yes I have 6 drives) that was inaccessible....I have trouble believing that 18 were bad. Other Thoughts: Not sure....ill have to hook up the "bad" drives to test them and confirm which defeats the point of having it in the 1st place. We apologize for the inconvenience this may have caused you. Rest assured, providing the best product and customer experience is our top priority. Please contact Newegg and see if they can help you track the package for you. Thank you for looking into our products. We do value your patronage. Other Thoughts: It never worked. I bought this years ago off newegg and recently tried to use it again, still doesn't work. In fact, it messed up my HDD. Be careful. I'm sure I just got a defective one, but it's far too late for a return lol. Providing the best product and customer experience is our top priority. 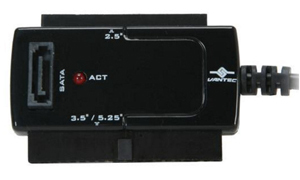 If you have questions about our products or anything that are not functioning the way it is advertised, please feel free to write to us for assistance at support@vantecusa.com. We will try our best to support and answer your questions. Thank you for looking into our products. We do value your patronage. Pros: This is a device that I haven't used often (perhaps 1-2 times per year), especially when I am working on older IDE based computers that still have a useful life. The last time I used it was in December 2017 when I was transferring the OS from an XP based hard drive built 8 years ago onto a SATA SSD. Pros: Works with PATA, SATA hard drives and floppy drives. Great for testing bare hard drives on almost any computer. Eliminates the need to either open up the computer to install the drive internally or install the drive into an enclosure. Other Thoughts: When I first purchased this, I thought that the contacts in the "inline" power switch were flaky. Two years down the road, the unit would not power up at all. Turns out the issue was a poor quality power cable. Replaced the cable with a known good unit. The adapter is now stone cold reliable. So if you have one of these and the green LED lamp on the power switch flickers or acts weird, try replacing the power cable. Over all, I'm very happy with this unit. Well worth the money [$12 on sale] I spent on it. I deducted 1 star because of the bad power cable. 4 years of ownership and the power supply has failed. This unit was lightly used over that time, no more than 25 uses. I deducted a second star for this. 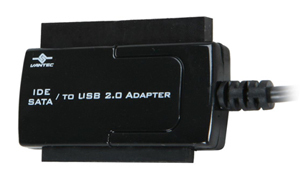 FYI, I recently purchased Vantec's USB 3 version of this adapter. It uses a different [and better] power supply. The power supply from the USB 3 version will also work with this older USB 2 unit. Cons: The case,/shell for the drive interface, separated almost right away . . . while using it to access an IDE 2.5 drive . . . didn't want to mess with it while drive was backing up . . no easy way to "duct tape" because of the way the drive interfaces are situated, and superglue could be an issue (have not tried) as "super glue" could easily "melt" the wire insulation. Pros: -absolutely essential for pulling data off of not only older hard drives but also good for copying data from them said drives to older computers as well! Cons: -just one con and it is the reason I took an egg off worth and that is be careful when installing this as you could accidentally plug in the power cord to the power adapter the wrong way and end up shorting out all of your attached hard drive devices. Other Thoughts: I would highly recommend this device to others it is worth its weight in gold and then some. Cons: Junk wall plug to AC unit, not a problem for me as i have about 6 other plugs to use. 10/18/2017. The switch on the brick to hdd is junk and cuts out if you bump it. Over all, still works well enough besides. Other Thoughts: short sata data plug but not a bother as it does work. lots of reviews said it was a fail unit or dies after a few useis, ive had a bit of workin with it thus far and no problems yet but with a old ide lap top HDD (could not read it) and ps 3 80 HDD (could not read it). I have used 2 sata lap top drives and 1 phat ide drive so far and they worked well for me, i could even play full games from them. Remember to read the info slip that is in the box to know how to operate this item!!!!! Will repost in a year or when it dies for en up-date. 08/30/2011 to 10/18/2017. Only the switch is giving me issues now, still not much of an issue for me.